Despite being down two jobs at this point—three, if you count his dried-up Hollywood career—Steve Bannon is in high demand on Capitol Hill. CNN reports the unkempt lump that briefly served as chief strategist to the disheveled heap that’s still president was called before the House Intelligence Committee on Tuesday to talk behind closed doors about the Trump family and campaign’s possible Russia ties. 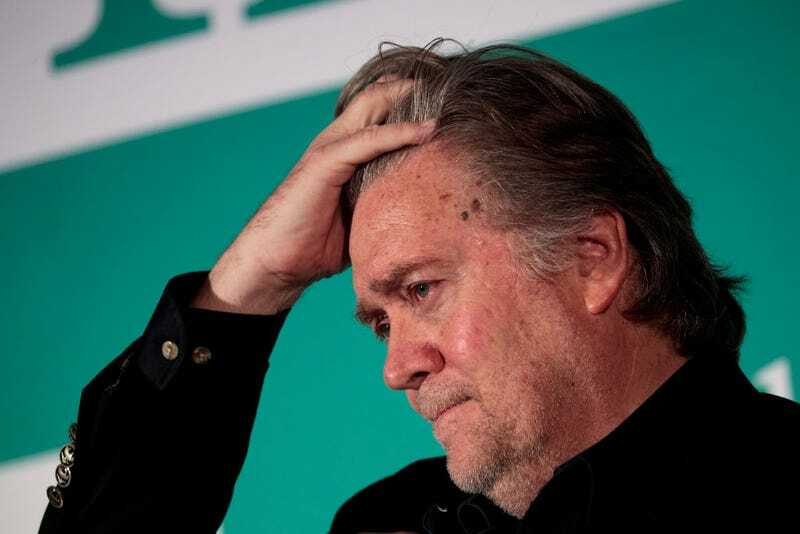 This was in wake of the explosive claims Bannon made in Michael Wolff’s Fire And Fury, including referring to Jared Kushner and Donald Trump Jr.’s meeting with Russian ambassadors as “treasonous” and “unpatriotic.” And we can mark another spot on our Trump impeachment bingo cards, as The New York Times reports that Bannon’s been subpoenaed in special counsel Robert Mueller’s investigation on Russian interference in the 2016 presidential election. The Times notes the subpoena for Bannon, who certainly has free time for all these meetings now that he’s been (jack)booted from his Breitbart gig, could just be a “negotiation tactic.” The publication posits that Mueller could be offering to skip the grand jury in exchange for Bannon submitting to questioning by investigators in the “less formal setting” of special counsel offices, though it doesn’t have an answer for why the self-pleasuring former Trump official would get this level of consideration. Neither a Mueller spokesman nor a senior White House lawyer responded to the Times’ requests for comments. Obviously, no one wants this white supremacist to have an easy out of anything (except a high-ranking position in the White House, or at a racist publication), but if it really does get the collusion ball rolling, then just this once, it’s acceptable.